Enabling the Overtime settings will allow admins and managers to properly track and calculate overtime within the account. Based on the rules set in the image above, overtime will be calculated at 1.5 times the employee's wage for any hours scheduled or worked beyond 8 hours in a day, but less than 10. If an employee is scheduled or works beyond 10 hours, all additional hours will be calculated at 2 times their wage. The weekly overtime option allows you to start calculating an employee's hours as overtime once they reach a set amount of regular hours worked in the week. Keep in mind that this limit will not include any accrued daily overtime hours for the week. Based on the rules set in the image above, overtime will be calculated at 1.5 times the employee's wage for any hours scheduled or worked beyond 40 regular hours within a set week. The work week follows the same week set as your schedule. So, if you schedule is set to start on Monday, these overtime hours will be based on a work week of Monday - Sunday. The consecutive days option allows you to calculate overtime when an employee works a set amount of days consecutively. This also applies only within the specific work week, set by your scheduled start day as mentioned above. Based on the rule set above, overtime will be calculated at 1.5 times the employee's wage for all hours scheduled beyond the 4th consecutive day. The 5th day and any further consecutive days will have all hours calculated as overtime until that employee receives a calendar day off. You will receive warnings when scheduling employees into both daily and weekly overtime. Daily overtime will be indicated by a red cell on the specific shift. Weekly overtime will be indicated by a red cell around the employee name. 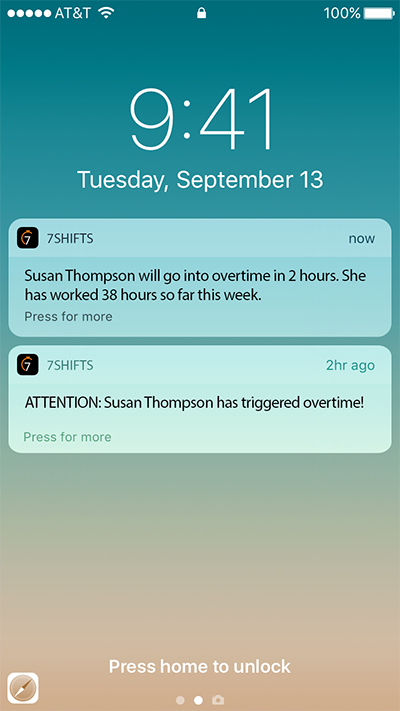 Overtime (OT) Alerts send a push notification to all managers of an employee when an employee enters daily overtime, weekly overtime, or is at risk of hitting weekly overtime with their scheduled shifts and actual labor already worked. NOTE: You will need to be on The Works or Gourmet plan to use this feature and have a labor integration or 7punches enabled. To update your plan, navigate to the Billing page by hovering over the profile picture in the top right > Company Settings > Billing. To learn how to integrate with your POS time clocking system please click here. Once you have the above prerequisites, go to Company Settings > Labor and enable Overtime Alerts. If you don’t already have Overtime enabled on your account you will need to enable 'Overtime' and set what your daily and weekly overtime values should be in 'Overtime Alert'. 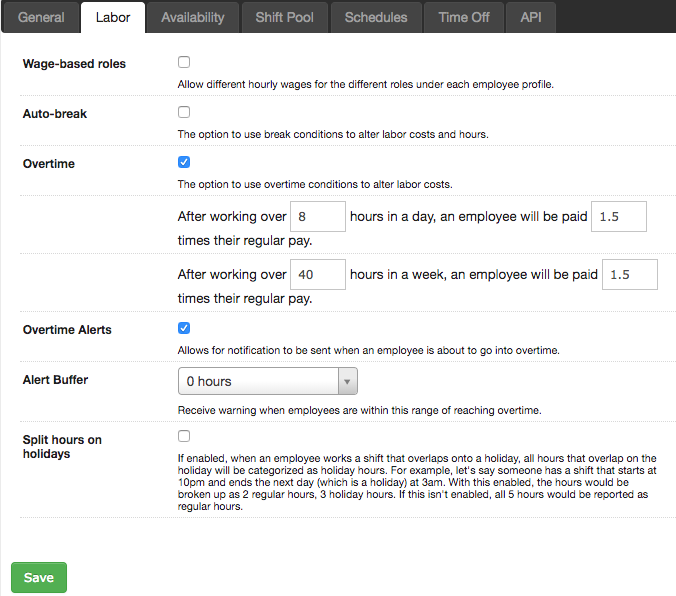 Once you have your Overtime Alerts values set and enable Overtime you will be set. Your managers will receive a push notification on their phone when an employee enters into Overtime or are at risk. A weekly at-risk Overtime alert is calculated by: 'Actual hours' worked + 'Scheduled Hours' for the remainder of the week > Weekly Overtime Hours setting. Note: At risk warnings will come up anytime an employee punches in to ensure their current working manager is aware of the potential inflated cost. Want to learn more about labor compliance? Click here for information regarding Custom Breaks. Overtime will impact your actual labor.